Cruising in and out of Vancouver presents a unique challenge; the time gap between hotel check-in/out, cruise ship boarding/disembarkment, and flight departure. By taking one of our pre/post-cruise tours, we help bridge the gap in your day while taking care of your luggage. Let us know your cruise ship details and we do the rest! Get picked up from your hotel for one last tour before you depart. Use your cruise line baggage tags, and we’ll take your luggage directly to the ship for you. This way, when you’re dropped off directly in front of the cruise ship terminal, your luggage is already looked after. Keep your boarding passes, passports, and any other medications/items with you that you might need throughout the day. Pre-Cruise Vancouver City Highlights Tour: The best way to see our beautiful city. See highlights like Stanley Park, Granville Island, and Chinatown in just one day. Pre-Cruise Peak & Canyon Tour: This half-day excursion includes stops at the Capilano Suspension Bridge Park and Grouse Mountain Resort. Both of these tours finish at 2:00 PM, so we will have you at the cruise ship terminal in plenty of time for your cruise ship check-in. Skip the taxi lines, and see this beautiful city as soon as you disembark the ship, and before hotel check-in. We secure your luggage on board the bus and at the conclusion of your tour, you will be taken to your hotel later in the afternoon, just in time for check-in. Post-Cruise Vancouver City Highlights Tour: The best way to see our beautiful city. See highlights like Stanley Park, Granville Island, and Chinatown in just one day. Post-Cruise Vancouver Delights Tour: This combination tour showcases everything on our Post-Cruise Vancouver City Highlights Tour while also taking you to the Capilano Suspension Bridge and Capilano Fish Hatchery. Post-Cruise Sea to Sky Tour: Features the scenic Sea to Sky Highway, and its main attractions, including the Britannia Mine Museum and the Sea to Sky Gondola. Post-Cruise Mountain Discovery Tour: Stops at the Capilano Suspension Bridge, Capilano Salmon Hatchery, and Grouse Mountain Resort. Meet your Landsea Tours representatives dressed in blue and looking for you in front of the cruise ship terminal at Canada Place. Once you disembark your ship and clear customs, please proceed to the street level entrance of the Vancouver Convention Centre East (approximately a five to ten-minute walk from where you disembark). Join one of our post-cruise tours directly from the cruise ship terminal. Tour with your luggage securely on board and be taken to the Vancouver Airport in time for your evening flight. We have a list of flight times that we can accommodate depending on the tour. 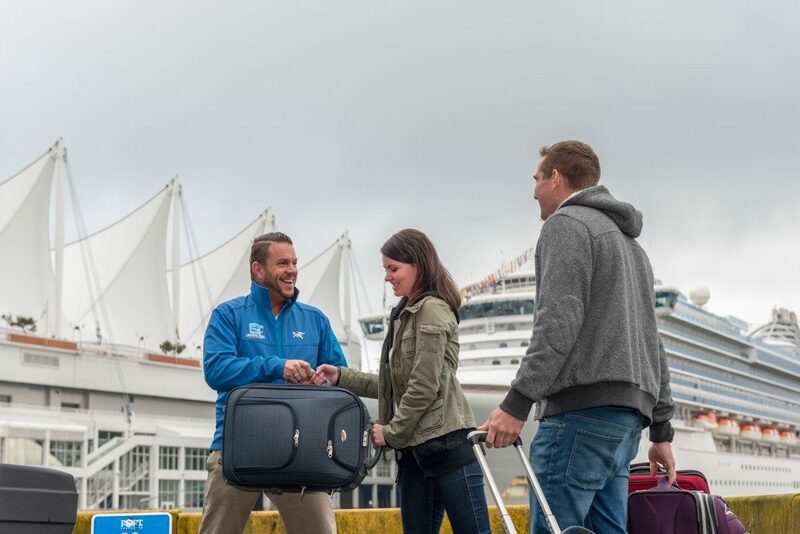 Please contact our friendly Guest Services Team at 604.255.7272, toll-free at 1.877.669.2277, or email reservations@vancouvertours.com to find out which option is best for you.